The 3rd Annual Fishbowl went off Wed, April 24th in perfect little waves at Rivy. …Lost rider Nate Yeomans puts on the event every year for the San Clemente locals and visiting pros. Everyone puts in 20 bucks for the prize money and the pros are each teamed with a grom. The kid prizes this year included a free custom …Lost surfboard to the 1st Place Grom. 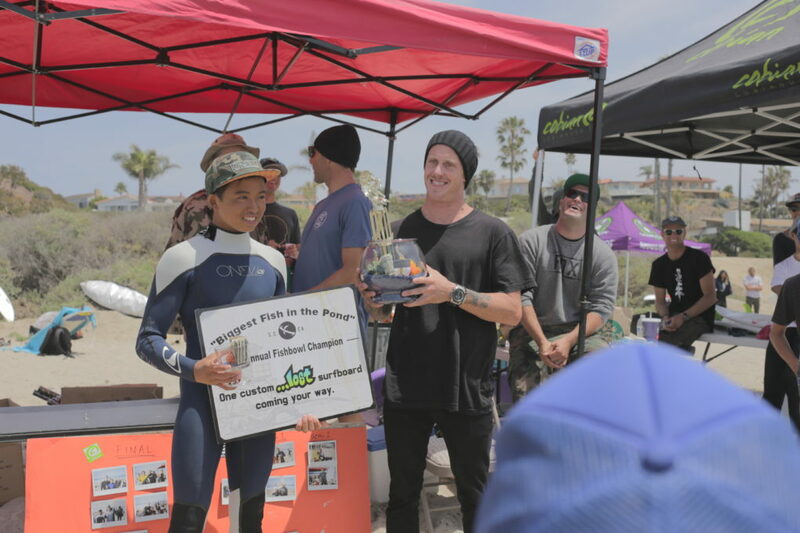 Congrats to the winning team of Chippa Wilson and Kei Kobayashi, who won on his …Lost board and now gets to add to his growing pile. Other finalists included Kolohe Andino, Luke Davis, Jeremy Carter, Tanner Gudauskas, Taj Lindblad, Crosby Colapinto, Griffin Colapinto and Gus Day. Other prizes included a …Lost SurfSkate, Flip Flops, tons of stickers and …Lost DVD’s. Thanks to Nate for putting on another great event. Check out some photos below. Rick Downes, Jonah Carter & Jake Davis. Brothers Griffin and Crosby Colapinto. Contest director Nate Yeomans and daughter. “Gimmie some of that grom!” Kolohe pulling rank on the Acai bowl. Cannon Carr was ripping for the groms. Looks like he got a hold of an old Wardo pad for his 4’2″ Robo. Wardo and Robo are always a perfect pair. Kolohe and Keanu Asing discussing the judging. Team guy Rick Downes checking Luke Davis’ equipment. Dylan Goodale, Luke Davis and Taj Lindblad. At this contest the WCT pros wax the kids boards. Kolohe showing grom partner Gus Day some inside waxing techniques before the final. Jeff Lukasik and Taj Lindblad. SK was down there shooting. He shot a lot of the footage in 5’5″ Redux and other …Lost videos too. Taj Lindblad ready for the final. It’s not as fancy as the ASP web cast but here are your finalists. Yeomans laying down the rules. Taj Lindblad collecting prizes from Nate. “You dropped you’re prize grom”. Crosby Colapinto won the …Lost SurfSkate. And since our bosses are going to wonder why no one thought to take the SurfSkate out of the plastic bag here’s what it looks like. Griffin Colapinto picking his prize. Too many prizes to hold. 2014 Fishbowl Champions Kei Kobayahshi and Chippa Wilson.